Renowned builder Puri Constructions bring to you an exciting new residential township in Faridabad called Puri Pratham. The luxury mid rise complex is situated in Sector 84 in Faridabad area on 10 acres of lush green land. Puri Pratham Faridabad flats have been aesthetically constructed with plenty of natural green plants. Apart from this, the interior is full of elegance and luxury. The buildings are sprawled in a huge complex that is full of greens that are perfectly landscaped at Pratham Greater Faridabad. The entire bedrooms have modular cabinets, along with a modern modular kitchen, where the builder has ensured that it is made of top-quality wood and marble. All the residential towers in the complex are surrounded by a central lawn, giving you open spaces to relax and rejuvenate. 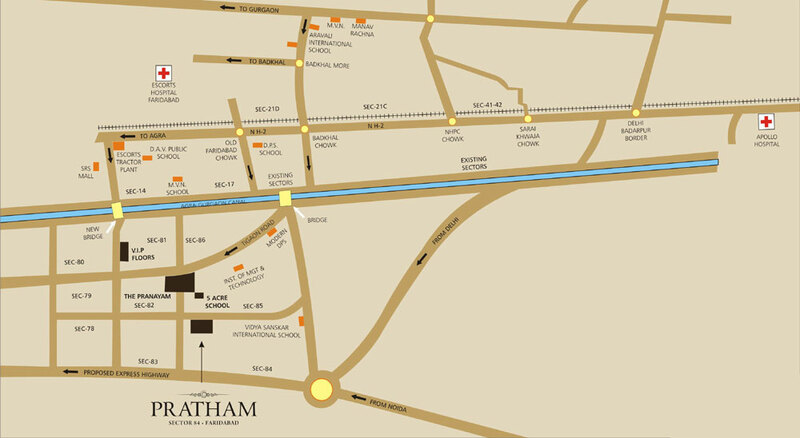 Puri Pratham Sector 84 has 2BHK + Study and 3 BHK apartments offering plenty of space. The size of the apartment’s ranges from 1300 sq. ft to 1400 sq. ft to suit every family needs. Using the luxurious features along with a well-located area, it provides the most sophisticated existence in Faridabad. Puri Pratham’s residential complex is embellished with the best of in-house amenities for the comfort and of the privileged residents. The mid-rise luxury apartments (G+10) come with high speed lifts, 24 hour video security, swimming pool to relax and rejuvenate, a kids’ play area where your little one can play, club house, a multi-purpose hall, ample car parking space, lush greeneries where you can take a stroll and relax, and a state of the art gymnasium for fitness enthusiasts. The complex is in close proximity to leading schools like Modern school, DPS, Shiv Nadar, Mothers pride. The apartments are also near leading hospitals, five start hotels, shopping malls, etc. Just 10 minutes from the metro station the Puri Pratham, Faridabad gives you excellent connectivity to the rest of Delhi (NCR) region. This is one of the hottest selling projects in Faridabad. The Puri Pratham price for the apartments starts from 61.75 lacs onwards, making it a highly desirable project in Faridabad. These flats make perfect living spaces - cozy and warm. Puri Construction is a leading company which is known for building quality, aesthetically designed projects. Designed for families Puri Pratham is the perfect place; so go ahead and book your luxury home now in Faridabad.